CAMARILLO, California, February 1, 30, 2012 (ENS) – A sports car powered by roof-integrated solar cells took off this week on a 21,000-mile quest to circle the entire globe, propelled only by the rays of the Sun. The SolarWorld Gran Turismo is the fruit of a collaboration between solar panel maker SolarWorld and Bochum University of Applied Sciences in Germany. Their goal in circumnavigating the planet is to be recognized in the “Guinness Book of World Records” for the longest distance covered by a solar car. “The SolarWorld GT is an ambassador for sustainable personal transportation, reminding us that the power to shift our driving habits away from dirty fossil fuels is within our grasp,” said Kevin Kilkelly, president of SolarWorld Americas, based in Camarillo, California. “Clean energy from the Sun is there for the taking – without depleting the Earth’s riches,” he said. 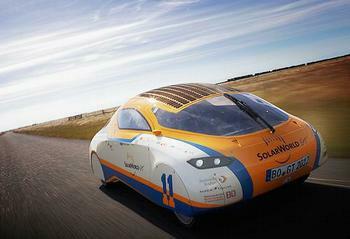 The two-seat SolarWorld GT set out across the United States today from Half Moon Bay, California. Over 49 days, the car will make five planned stops along a 3,774-mile route from California to South Carolina. The solar car has visits scheduled in California, Arizona, Texas and Florida at universities and non-profit organizations. At each stop, SolarWorld and the vehicle’s drivers and crew – the college students who developed and designed the SolarWorld GT – will host a reception showcasing the vehicle. One lucky audience member at each stop will get a ride in the solar car. Throughout the vehicle’s American road trip, SolarWorld’s Facebook page will host a contest that asks participants to guess where the SolarWorld GT has been at various points along its journey across the United States. Clues will be given between each stop and winners will receive SolarWorld merchandise. All participants will be entered into a drawing to receive an Apple iPad 2. Headquartered in Bonn, Germany and Hillsboro, Oregon, SolarWorld produces high end crystalline silicon solar-power technology. Worldwide, SolarWorld employs about 3,300 people. Under the name Solar2World, the group supports care projects using off-grid solar-power solutions in developing countries. SolarWorld AG has been quoted on the stock exchange since 1999 and today is listed on the TecDAX and OkoDAX as well as in the sustainability index Natur Aktien Index, which tracks the performance of companies selected as ecological pioneers.